The Stock Market is Overvalued. 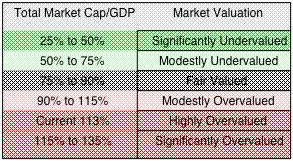 Based on historical ratio of total market cap over GDP it is likely to return 1.1% a year from this level of valuation, including dividends. As of today, the Total Market Index is at $ 20435.9 billion, which is about 113.2% of the last reported GDP. The US stock market is positioned for an average annualized return of 1.1%, estimated from the historical valuations of the stock market. This includes the returns from the dividends, currently yielding at 2.12%. As of 03/03/2016, the stock market is likely to return 1.1% a year in the next 8 years. CONCLUSION: Investment in Index Mutual Funds that track S&P 500 is not advised for an investor at this time.